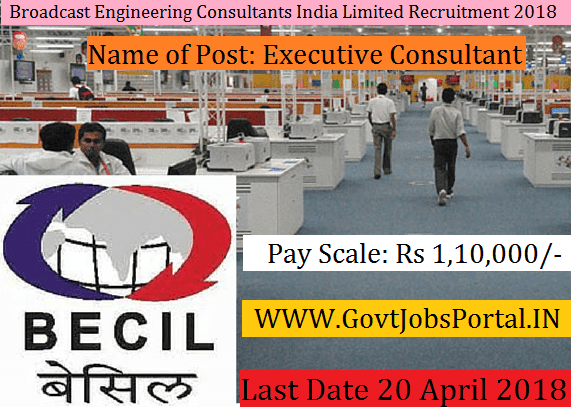 Broadcast Engineering Consultants India Limited jobs has published Employment News for Executive Consultant Posts. Interested and eligible candidates can have online application scheduled from 20-April-2018 Online can be registered online on the official site, all candidates are requested to submit all necessary employment related information before applying for this government job. Total numbers of vacancies are 09 Post. Only those candidates are eligible who have passed Master’s degree from a reputed Indian and International Institute/ University. Preference will be given to Master’s Degree in Development Policy/Public Policy/ Social Policy. Additional MBA degree (in entrepreneurship/ rural managemen/ marketing/ finance) with the above Master’s degree will be an added advantage. Indian citizen having age in between 18 to 40 years can apply for this Broadcast Engineering Consultants India Limited jobs Recruitment 2018. Those who are interested in these Broadcast Engineering Consultants India Limited and meet with the whole eligibility criteria related to these Broadcast Engineering Consultants India Limited jobs below in the same post. Read the whole article carefully before applying. Educational Criteria: Only those candidates are eligible who have passed Master’s degree from a reputed Indian and International Institute/ University. Preference will be given to Master’s Degree in Development Policy/Public Policy/ Social Policy. Additional MBA degree (in entrepreneurship/ rural managemen/ marketing/ finance) with the above Master’s degree will be an added advantage.